W.D. Westervelt : Old Hawaiian Games in Honolulu, 1916. A.H. Ford, Honolulu, Volume 12, Number 4, October 1916. A very brief acknowledgement of the sport of surfing, and some other water games. The accompanying photograph had been widely reprinted by 1916. Hawaiian games, both to the participant and observer. Now the white man has taken up this typical Hawaiian sport. The traditional malo (loincloth) was possibly a prop to enhance authenticity. How the ancient Hawaiians amused themselves and kept their health. The visitor found himself by the sea (page 346) side. 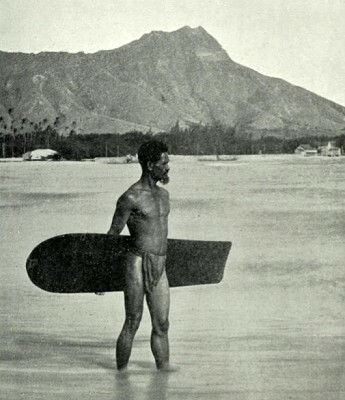 He looked out over the surf (nalu) and on the surf waves saw many spirits with their semblance of surf-boards sporting in the surf- full of the joy of surf-riding at heavenly Waikiki. This was the same sport as the hee-nalu or riding the surf the spirits had known while living in their bodies by the sea. Lele was the game of leaping down precipices, or diving in deep waters. Ku-lou-poo was diving with the head down. Kou'ali was a swing made by using long vines. 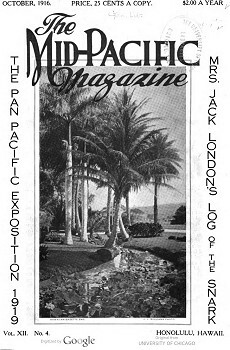 This was a game mentioned several times in legends referring to adventures in the Hawaiian underworld. Volume 12, Number 4, October 1916. Geoff Cater (2016) : W.D. Westevelt : Old Hawaiian Games, 1916.